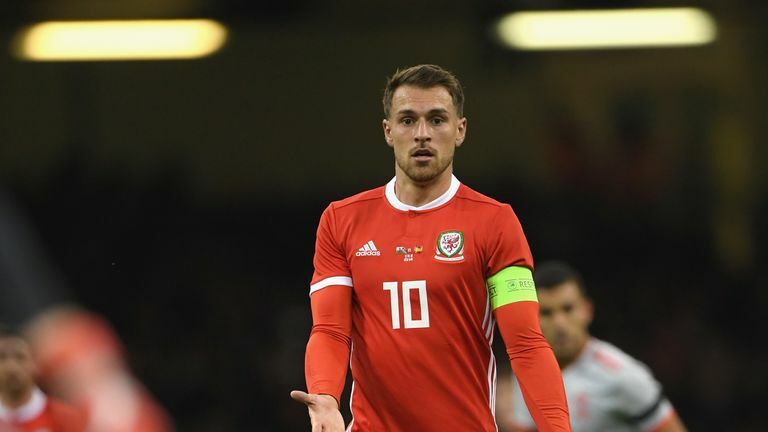 Aaron Ramsey has been ruled out of Wales' friendly against Trinidad and Tobago on Wednesday with a thigh injury. The Arsenal midfielder was not in training on Tuesday, but will recover in time for Sunday's European Qualifier against Slovakia in Cardiff. Tom Lawrence, Sam Vokes and Ethan Ampadu were other notable absentees from Tuesday's training session at Manchester United's Carrington complex. Wales manager Ryan Giggs revealed they had not met up with the squad due to injury and will not be available for the friendly against Trinidad and Tobago, or the opening European qualifier against Slovakia. He told a news conference on Tuesday: "Aaron's just got a slight knock to his thigh and we are monitoring that this week, but he should be OK for the weekend. "Tom Lawrence, Sam Vokes and Ethan Ampadu all haven't met up with the squad. They've all got different injuries. "Ethan's got a slight back strain. Tom Lawrence, I was at [Derby vs Stoke], he took a blow to his other ankle. He had been struggling with one ankle and then got a knock on the other ankle. "Vokesy has been struggling with a groin problem. He played 70 minutes and then just felt it again. The three of them are all unavailable."